Storyboarding and script writing go hand-in-hand. Storyboard Pro lets you use your Final Draft script to create a new Storyboard Pro project. This feature is a time saver as it handles the creation of scenes and panels, as well as inserting all the text in the proper captions automatically. The following steps give detailed instructions on how to import a typical Final Draft script and automatically break it down into scenes and panels. Since scripts are never really written on a "per-panel" basis, and every script is paced and structured differently, you may have to try different settings to get optimal results, and you may have to combine or split some of the automatically generated panels manually to best fit the pace of your story. The term Scene becomes Shot. The term Sequence becomes Scene. The steps below will specify the term for both terminology preferences where applicable. For more information on the Import from Final Draft dialog, see Import from Final Draft Dialog Box. In the list to the left, select Scene Heading. In the Action drop-down, select New Scene (animation terminology) or New Shot (live action terminology). Your storyboard will have one scene (or shot) for every scene heading in your script, and the scene's description will be added to the Notes caption of every first panel of every scene. In the Action drop-down, select New Sequence (animation terminology) or New Scene (live action terminology). 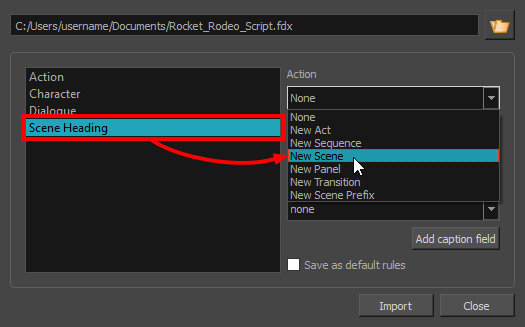 If your Scene Heading elements are numbered and you want to include their number in your project's captions, check the Include Element Number when available option. In the list to the left, select Shot. 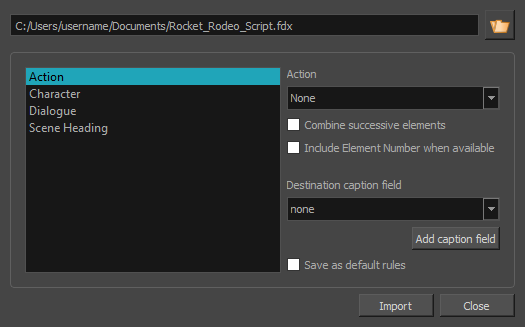 If your Shot elements are numbered in your script and you want to include their number in your project's captions, check the Include Element Number when available option. Your storyboard will have one sequence (or scene) for every scene heading in your script, and one scene (or shot) for every shot in your script. Their description will be added to the Notes caption of every first panel of their corresponding scene or sequence. NOTE For more information on creating a new Storyboard Pro project, see Creating Projects.